Environmental criminology describes the relationship of the individual environments in which crimes occur and how they influence or contribute to criminal activity and behavior. Criminologists insist that there are four necessary elements for a crime to occur. If one of these elements are not present, then no crime has occurred. Law: First, there must be a law to be broken. If the activity is not illegal, then obviously it can't be criminal. Offender: Second, someone must have broken the law. If there is no offender, there is no crime. Victim or Target: Third, in order for an act to be criminal, there must be a victim. In so-called "victimless" crimes, the state or community as a whole is said to be the victim because of the problems that are believed to be a result of the behavior. Place: Fourth, the activity or behavior must have occurred in a place. There can be no crime in a vacuum. For environmental criminologists, the fourth element, the place, is the focus of their studies. The field began to develop in the early 1980's and looks at the environmental factors that they believe can lead to influence crime and criminal behavior. In studying the place, environmental criminologists are not so much focused on the geographic location, but on the elements within the location, such as lighting conditions, the state of repair or disrepair that buildings may be in, and other neighborhood conditions. Environmental criminology looks at data such as the time and place of crimes in order to help law enforcement officers better understand where crimes are occurring. This helps police officers focus their patrols in order to take a more preventative approach to crime solving, as opposed to a reactionary approach. In this way, environmental criminology is complementary to community-oriented policing. One of the most recognizable examples of environmental criminology put into practice is the crime map. 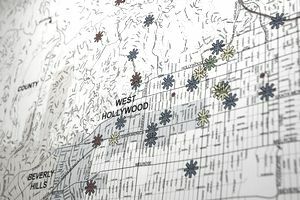 No doubt, you've seen television shows or movies, or maybe you've ever been to a local police station, where you've seen a large map posted to a wall with pins and other markings on it. Those pins or marks indicate areas where crimes have occurred and are a very basic example of what criminologists call "crime mapping." Environmental criminologists take the mapping even further, pouring over the data to search for patterns. The ultimate goal is to use any patterns they locate to help identify the root causes of the crimes and help devise workable solutions to the problem. For example, if a large number of robberies are occurring in a specific place at a specific time, environmental criminologists will want to look at that location at that time to determine what the contributing factors may be. There is a belief held by some criminologists that fit in line very well with the overall idea behind environmental criminology. The thinking is that people act according to what they perceive to be the social norms of their environment. When other people are not around to demonstrate normative behavior, people must instead look to their environment for clues. The "Broken Windows Theory" suggests that the physical and visible state of the buildings, lawns, homes, and businesses provide important cues as to how people behave in that area. The idea is that the more broken windows there are in the neighborhood, the higher the likelihood that there is a crime in the area. Environmental criminology is a new and developing field, with plenty of room for growth. As technology advances in criminological studies, the ability to identify and isolate patterns in criminal activity will only increase, in turn increasing the need and desire for qualified individuals to gather and interpret the data. If you are a person who is interested in a career as a criminologist, especially if you enjoy finding patterns and solving problems, a career as an environmental criminologist may be just the job for you.